BlogALEC Gives Cash to Congressmen? ALEC Gives Cash to Congressmen? The American Legislative Exchange Council (ALEC) strategy of corporations enact favorable legislation at the state level across the country by wining and dining state legislators at fancy conferences and then presenting them with model bills to shepherd into law is well documented. Apparently, ALEC also sees value in currying favor at the federal level as well. Common Cause’s Nick Surgey reports that ALEC gave a cash award of $1,350 to Rep. Eric Cantor (R-VA) in 2009 as part of their Thomas Jefferson Freedom Award, according to an investigation of ALEC’s tax filings. This presents a potential breach of ethics because House members are prohibited by law from receiving any cash gift. Although ALEC’s primary focus is in promoting corporate-friendly state legislation, the group also has a clear federal agenda. A 2005 ALEC document obtained by Common Cause outlines 42 distinct ALEC model bills that attempt to influence federal policy. Those bills include resolutions calling for lower corporate taxes and supporting construction of the controversial Keystone XL pipeline. 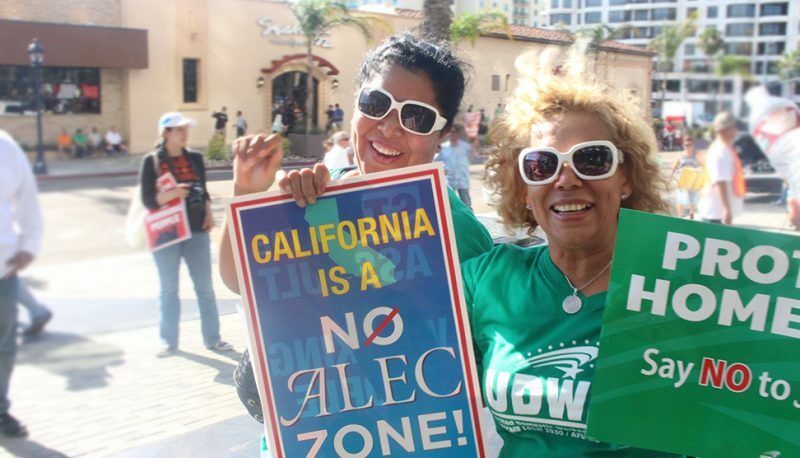 In effect, corporations working through ALEC are using state legislators to lobby Congress on their behalf. ALEC boasts of the 91 “ALEC alumni” currently serving in the US House, including both Eric Cantor (R-VA) and House Speaker John Boehner (R-OH). As Rep. Cantor graciously accepts his award in this 2009 video, it’s not difficult to imagine how flattery and cash gifts can go a long way in winning the favor of powerful people. Rep. Cantor’s office subsequently released a statement denying that he took the cash and that the engraved bust he received was legal. This still doesn’t explain, as Common Cause notes, why ALEC considered the bust to be a cash gift on their tax filings, unless the value of the bust was high enough that disclosure was required.